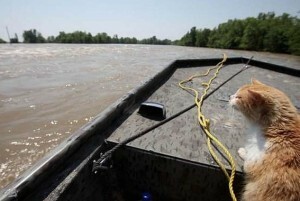 A newspaper team takes to the Mississippi river looking for Aisan carp and comes up with an orange tabby cat instead. 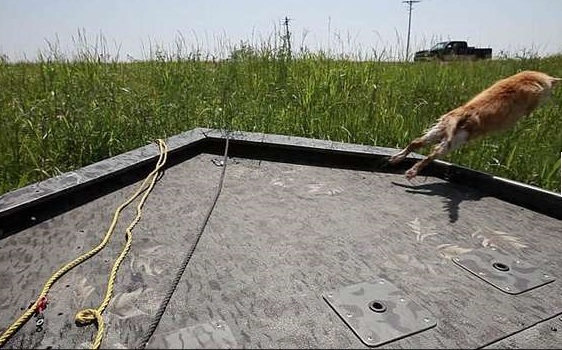 An investigative team from the Detroit Free Press takes a boat down the Mississippi river looking for Asian carp and comes up with an orange tabby cat instead. Reporters from the Detroit Free Press set out on May 2 for a seven state river journey to discover how far Asian carp may have traveled toward the Great Lakes, how much damage they may have done, and what the government is doing to contain them. RIDGELY, Tenn. — Ronnie Capps, a Tennessee wildlife officer, took us out in his boat on the flooded river today near the border with Missouri. We were riding on fast-moving rapids, on top of submerged roads and farms, and beside sandbagged secondary levees that broke. To us, it looked like a giant lake, but most of it was somebody’s land. We rescued an orange tabby cat from a burst levee. Ronnie guessed the bedraggled, half-soaked animal had been there about a week, since the waters started rising. It looked hopeless and half-dead, with water gushing all around it. We got it into the boat and it meowed frantically. We sped it to dry land, where it raced into the tall grass. 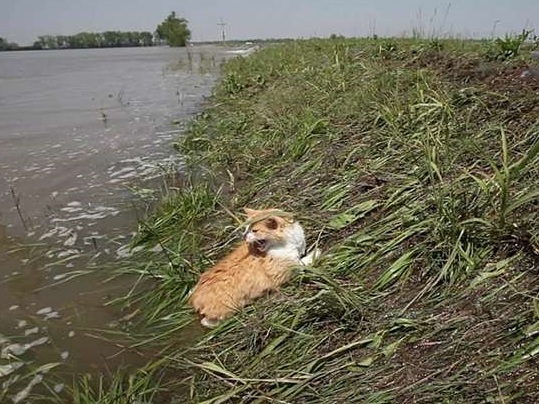 This orange tabby cat looked hopeless and half-dead, with water gushing all around it in Ridgely, Tenn., along the flooded Mississippi River. 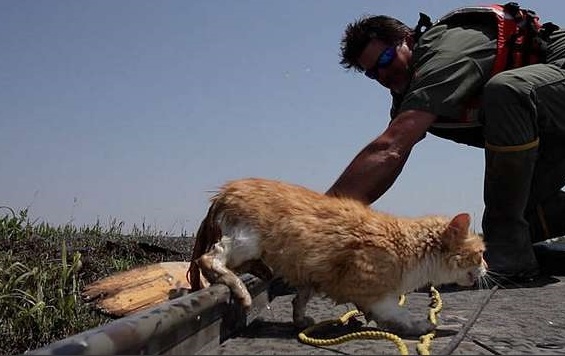 Ronnie Capps, a Tennessee wildlife officer, pulls the cat into the boat. The orange tabby got it into the boat and it meowed frantically. The team sped the cat to dry land along the flooded Mississippi River. When it reached dry land, the cat jumped into the tall grass. Ah, but if it kept into the grass, it didn’t stay rescued. Every cat saved is atrue miracle. So he just needed a lift? Would much rather had him checked by a vet and fed, rested and loved up a bit before he took off into the wild again~! Ungrateful cuss…….. Praying he’s okay~! Well, rescued from the broken levee and the river. We wondered where it ran off to, also. Bet the cat came out there to look for the carp too. 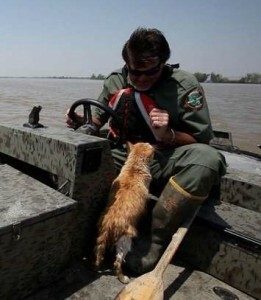 Glad the cat was rescued from the broken levee but wish it had been taken to a rescue group before being released. Hope the kitty is doing well. a history which finishes well, ouf ! I SOOO AGREE, Wanda! My first thoughts after reading about this partial rescue, at least the kitty is not in the water, but…..they could’ve gone one step further for his or her sake! darn it… I sure hope this gets publicity and someone takes care of the kitty now! We’ll try to check to see how near or far from homes and businesses this occurred. We have hoped the cat could run off home or to someone who’d help him but have no knowledge of that. At least he was saved from his predicament on the river. Did they try to hang on to him so he could be taken to a vet or at least a shelter, poor kitty, he was scared to death as it was , seems they could have wrapped a coat around him to keep him warm and keep him from scratching them if that was a problem. I guess they did what they thought they should , thank you for that ,at least the kitty isn’t in the water any more. What they did was good, but not quite good enough. Where there’s a will there’s a way! After watching so many animals shows where they do nothing, just let nature takes it’s course, it is nice to know someone did something. Hopefully he just got caught off guard and needed a lift to a dry land. It’s nice they rescued it at first, but this kitty needed water right away and then food and how about a good home? That would be a real RESCUE for this poor guy or girl! Who knows where it lives or if it had a home, a microchip to check to trace it’s home??? Now it’s just living in the wild again, so not the best outcome, if it was someones pet..I hope not, if people would keep their cats INDOORS always, this guy or girl would not be out there in the elements and danger…that’s IF it has a home…but something to think about always..I hope someone took this kitty in for water and food after this?? ?